Colgate Optic White Toothpaste is a leading toothpaste when it comes to whitening. With double the amount of whitening ingredients as most other toothpastes, you can expect to see whiter teeth in just 3 days (view on Amazon). Your toothpaste plays an important part in your oral hygiene. Despite this, choosing the correct toothpaste can be a difficult task. The main way in which we combat gingivitis (gum disease) and prevent tooth decay is by effective brushing with a good toothpaste. Use of an ineffective toothpaste can lead to poor oral hygiene, which can cause many problems. But when it comes to toothpastes, making a choice can be incredibly difficult. With so many different options on the market, how do you decide which one is right for you? Find out the 5 things you need to know in this Colgate Optic White Toothpaste Review. What makes a good toothpaste stand out from a mediocre toothpaste? Most toothpastes will clean your teeth, but an ideal toothpaste should also protect the teeth and avoid doing damage simultaneously. 1.) It should contain at least 1000ppm of fluoride. Fluoride is a mineral which strengthens the enamel (outer surface of your teeth) and helps to prevent tooth decay. 2.) A good toothpaste should make use of artificial sweeteners, such as saccharin, instead of sugar. This is because sugar contributes to tooth decay, so adding sugar to the toothpaste contradicts the work that the toothpaste is doing. 3.) A good toothpaste should also have a relative dentin abrasivity that is less than 250. A toothpaste which has a high relative dentin abrasivity can damage your teeth by scratching away at the enamel. 4.) Your toothpaste should help you to maintain a good, regular oral cleaning regime. This means that you should get along with it – if you don’t like the taste or texture, you’re going to be less likely to use it regularly. How does the Colgate Optic White Toothpaste measure up? Makes you want to use it The wide tube design makes the toothpaste easy to store safely on its lid. Additionally, it comes in a variety of mint flavours, leaving you with minty fresh breath. As well as ticking all of the boxes of the ADA’s criteria for a good toothpaste, the Colgate Optic White Toothpaste goes even further into cleaning your teeth, and actively whitens them. This works via a whitening ingredient, which allows for deep whitening. Colgate Optic White Toothpaste appears to be an effective toothpaste. Not only is it good for cleaning and protecting your teeth, but it has the added bonus of whitening with no extra effort. While it is slightly more abrasive and has less fluoride than some other toothpastes on the market, when it comes to whitening toothpastes, these scores are much better than many other choices. Furthermore, it is priced at a competitive $5 which is a low price tag amongst many whitening toothpastes and products. 1.) Does Colgate Optic White Toothpaste work? Colgate Optic White Toothpastes stands out amongst toothpastes due to its whitening capabilities. Tooth whitening has risen rapidly in popularity in recent years, with reports that whiter teeth can boost confidence, as well as creating a more youthful appearance. Teeth can become discoloured for a number of reasons. One of the most common factors is regular consumption of staining foods and drinks such as red wine or coffee. Colgate Optic White Toothpaste contains hydrogen peroxide, a common ingredient used in over-the-counter whitening kits. Studies have shown that hydrogen peroxide is effective when it comes to whitening and can help to rectify both intrinsic and extrinsic stains. Furthermore, this toothpaste contains double the amount of whitening agent as your standard whitening toothpaste does, making it extra effective. This helps the toothpaste to deeply whiten, rather than simply addressing surface stains, like many other products do (view details). > When can I see results? You can expect to see results from your whitening toothpaste in just 3 days. However This is, dependent on correct usage. You should use the toothpaste twice a day for two minutes at a time. For full results, use as directed for 4 weeks. > How long will results last? How long whitening results will last is entirely dependent on your lifestyle. The Colgate Optic White Toothpaste is designed to be used as and when it is needed. If you regularly smoke or consume staining foods, such as coffee or red wine, then you can expect to need it more regularly than if you don’t. 2.) Will Colgate Optic White Toothpaste damage my teeth? The ADA’s criteria for a good toothpaste states that artificial sweeteners should be used in place of sugars, in order to not cause damage to the teeth. This toothpaste adheres to this, opting for use of sucralose and sodium saccharin to help create a desirable flavor, rather than using sugar. Many whitening toothpastes will be high in Relative Dentin Abrasivity. Whilst a score of 100 may be higher than non-whitening products, it is still substantially lower than the ADA’s recommendation of 250, meaning that if used as directed, it should not cause damage to your teeth. 3.) Does Colgate Optic White Toothpaste protect your teeth? The short answer is yes. The fluoride content in Colgate Optic White Toothpaste surpasses the minimum standard suggested by the ADA. Fluoride is the main active ingredient in toothpaste, and it strengthens the tooth enamel and helps to fight against cavities. 4.) How does Colgate Optic White Toothpaste taste? Colgate Optic White Toothpaste comes in 6 different variations, all of white taste of mint. They range from icy mint to fresh mint, but ultimately, you will finish brushing your teeth with a minty fresh breath. Colgate Optic White Toothpaste is ideal if you are looking for a toothpaste which whitens with little effort. It is effective at what it does and contains safe whitening ingredients which allow for deep whitening, rather than simply addressing surface stains. However, if you are looking for a toothpaste which is suited for those with sensitive teeth, Sensodyne True White Toothpaste may be better suited to you. 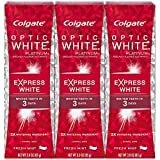 Colgate Optic White Toothpaste is an ideal toothpaste if you want whiter teeth (view on Amazon). With a fairly low Relative Dentin Abrasivity score for a whitening toothpaste, and ingredients which are used by professionals, it should be safe for daily use if used as recommended by the manufacturer. 1. Does this toothpaste contain microbeads? 2. Does it come in any flavors that aren’t mint? No – all of the flavors are variations of the same minty fresh taste. 3. What is the difference between Optic White High Impact and Optic Express Whitening? Optic Express Whitening is very similar to Optic White High Impact, but works faster. You can expect to see results after just 3 days if you use it as recommended by the manufacturer. 4. Can I use Optic Whitening toothpaste with any toothbrush? Yes, Optic Whitening toothpaste is designed for use with your favourite toothbrush. 5. Is it safe for daily use? Colgate Optic Whitening toothpaste is designed for daily use. If used as per the manufacturer’s recommendations, it should be safe. 6. How big is a tube? One tube of toothpaste is 3oz. 7. Is it okay if my teeth feel sensitive? Hydrogen peroxide, the whitening agent in Colgate Optic Whitening toothpaste has been shown to have occasional side effects of tooth sensitivity. If your sensitivity is mild and temporary, this should not be anything to be worried about. However, if it persists or is more than mild, you should consult your dentist.